If you're looking for an attractive Vermont gift, or a decorative maple syrup glass bottle for your kitchen table centerpiece, the shapes below are our most popular. 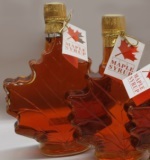 Need your maple syrup gift delivered right away? No problem. Since we are a small operation, when you shop with us we generally ship items the same day or within 24 hours. Best of all, we use the United States Postal Service's Priority Mail, so your Vermont maple gift will arrive in 2-3 business days. Aside from the Sampler, all maple syrup in glass containers is only offered in Grade A Amber pure Vermont maple syrup, unless a special request is made for any other syrup grade.